My gratitude to the organisers (Anne-Marie Colliander Lind and Cecilia Enbäck) for giving me an excuse to fly to Helsinki to attend the Nordic Forum of Translation Companies 2017. Up in the North, in the country acknowledged for having the best educational system in the World, a bunch of translation companies, translators, interpreters and technology providers met to learn, share and dance. Nuadda translates also from Nordic languages into Spanish, so it is a good opportunity for me to meet with current customers and leads. Besides, I went to college in Copenhagen, so it is always a good excuse to go back to the region. As we live in a visual era, I encourage you to look at these sketch notes. My notes below on some sessions I attended may be a complement to them. Please enjoy! The keynote was: How to Prevent and handle crises in media and social media by Katleena Kortesuo. We need to tell stories when communicating. Humans love stories and have been using them for entertainment, teaching, learning and for sharing our history, as they provide us with a structure to remember things. – Cinderella. We are poor, and you are creating empathy, the public want you to succeed… that’s why it is used for crowdfunding. Trump’s triumph is based on this character (although he was never poor). –David vs Goliath. Try to be David. Individual vs big corporations. The good and the bad. –Icarus. We wait for some people to fail. And the audience is ready to punish you if they feel you are Icarus. Her advices: Always be humble, do good things (charity). 2. Do not try to change it. 3. Never be a martyr (there is only one Jesus). 5. There must be a villain in any story. 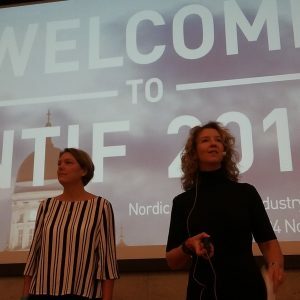 Another interesting session was that by Pirkko Trpevski Kyllöne (Språkservice Sverige AB) called: The value of 50 M. She guided us through the success story of her career as an interpreter running her own company. First interpreters in Sweden were immigrants, so language level was low. In 1993, interpreting for the health care system could be offered by private companies. In 1996, she created a foundation with her husband and her brother-in-law. Private sector does not have the same prerogatives as public sector: Come back tomorrow, we are out for lunch or in vacation, etc. 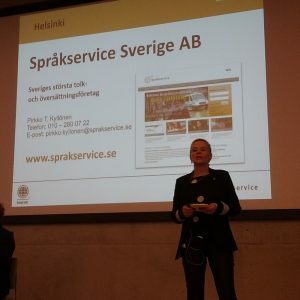 2000, they offered their interpreting services as a private company and Språkservice Sverige AB was born with a focus on transparency. Three owners with different skills. For her, the value of having a company worth 50 m Euro is that she can give back to the community via associations. She is very much aware that she is handling the taxpayer’s money. Another success journey has been that of Jani Penttinen (Transfluent). A 1.5 m Euro company whose initial strategy was to acquire clients for short deliveries with no minimum charge. He shared his success story on how they got crowdfunding. His company became known when Trump got elected as President of the United States and discontinued the Spanish section of White House website. Transfluent started translating the website unofficially. I remember the impact it had in the media in Spain. 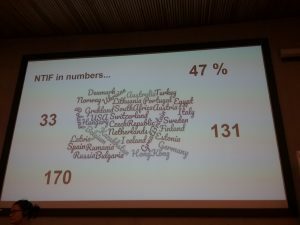 I happen to share Jani´s view on the fact that despite the use of MT (Machine Translation), more specialised and sensitive information will go to human translators. 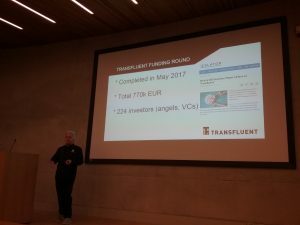 As Transfluent was the first translation company to get crowdfunding. Jani shared his experience on the differences between this and a Venture Capital (VC). For instance, there are many owners but with a low participation, so it is easier for him to take actions. With a quite provocative title: “Can you tell me again what globalization is”, Salvo Giammarresi from PayPal offered a great overview of how globalisation is addressed at the buyer´s side. If we are in this industry, we are supposed to already know what globalisation is, but when the speaker is as charming as Salvo, who works for a company that we all know; who operates in so many languages and countries; hey! Maybe he has some interesting stories to tell. The CMO is a hard group as they do not interfere with development, but more than often, marketing produces material that has nothing to do with the product. We can indeed help company apps become really international. CTO cares about automation and there is a strong connection between the code and the language. CEOs are usually the only ones who care about the customer, that’s why we need to speak to them. The head of globalisation has the best knowledge of the product within the company and the connection to the outside world. Advice for the in-house vs outsource dilemma: Hire the expertise you want to have closer. By the way, globalization at PayPal is just 1% of the company cost. And an advice for language services/solution providers: What can I offer that you cannot find anywhere else. Exactly: If you offer the same thing as everyone else, the conversation is just about price. 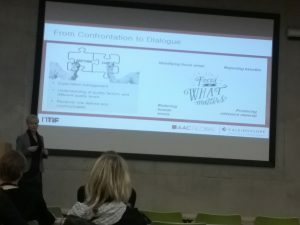 Henrik Lottrup from LanguageWire: #translation is not the need, it is communication. He also believes we have done a lousy job in selling our services. On the technology track, I wanted to mention the work that Klaus Fleischman´s company, Kaleidoscope, is doing with terminology. His company developed an interface that engaged his clients on this field. Although terminology can be a really good asset for a company, the translation workflows are complex in confirming terms, automatic checks are time-consuming due to false positives, we also see that source terms should be standardised as well, but how do we charge this? This is not done on a client´s side because of lack of awareness, lack of resources, lack of time. But more importantly, how do we change this? He also showed a business case about how to reinvent the review process together with Leena Peltoma (AAC Global). Take a typical translation workflow: translation and proofreading. When a proofreader receives a review assignment, what do they do? They amend it! That is what we tell the proofreader to do and they DO it, even if there is nothing to amend. We need to set expectations first. So it is sometimes a very inefficient process, which ends in confrontation about who is right and who is wrong, when it should be a feedback tool. The biggest issue can be the proofreader itself. We need to establish a process where you can see trends, ask yourself: Is this language improving? Focus on what’s important: consistency, the right message, the tone of voice.